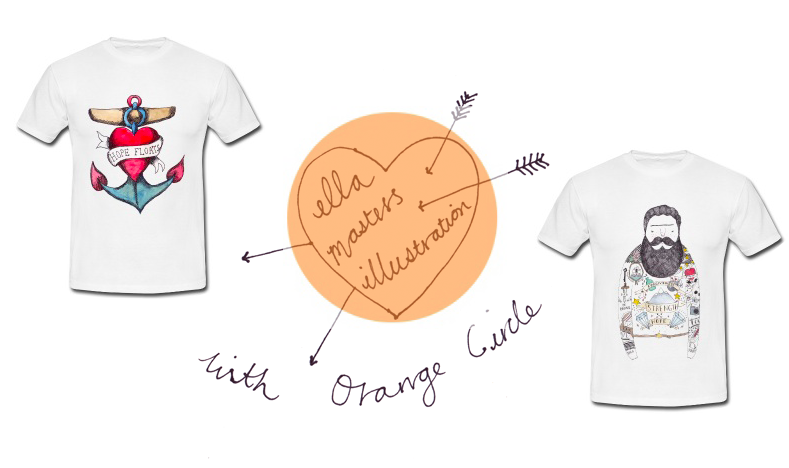 So I was contacted by the lovely Charlotte or Orange Circle who I am pretty sure you are all aware of they crete some amazing t-shirts, to create their first Designer collection with my Illustrations. We both decided on two favourites big pop and hope floats, this is the only place in the entire world at the moment where you will be able to purchase one of my illustrations on T-shirts both men and women sizes/styles. Big pop men and women sizes Hope floats men and women sizes. I’ve been running my little illustration shop not for that long since December, so I feel mega excited and so proud to have been contacted by such a wonderful company who want to share my illustrations with the world and in so many amazing t-shirt colours, I am definitely going to be getting my dad a big pop top because all of my bearded men are because of him. I think everyone should go and by big pop top and be awesome! I hope you like them? And I just wanted to say a massive thank you to Orange Circle for choosing my work to feature on their garments. They have lots of other amazing designs so check them out. Previous Post a sneak into my room. These tees are so cool, what an exciting opportunity! ahhh that's so cool, congrats! Congratulations,your illustrations are so good. I can picture many people who I know, including myself who would love to wear these. That's awesome – well done! that's excellent news ella, major steps!